When I started kayaking, I used to go regularly with friends and have a blast. Over time, with different work schedules and family commitments, my kayaking adventures with my buddies have reduced. I don’t really mind it though as I really enjoy the alone time that I get to spend with myself. However, sometimes I’d feel a bit lonely. Then I thought, why don’t I take my dog along kayaking? Dogs make a perfect companion on a kayaking trip. They won’t ever complain to you, you don’t need to pack a lot of equipment for them and since they have a low sense of gravity (the body weight is distributed on four legs), they make a perfect paddling partner. I really enjoy the company of my dog. I won’t feel lonely and I will still get my alone time which I dearly crave. Not only would I get to spend quality time with my buddy, but it will also be a great exercise for him. I felt that both of us will enjoy a relaxed time on the water. This led me down my search for the perfect dog friendly kayaks. You may think that it will be difficult to take your dog along when you are kayaking. But now since many manufacturers create kayak accessories that are specifically made to accommodate your dog too, finding one is pretty easy. Now, not only did my dog enjoy kayaking, he literally looked forward to it. Besides, it’s always funny seeing a kayak with a dog in it! Let’s get started on what you need to look for in a kayak for dogs. The two main things that you need to keep in mind when you choose a kayak that you can take your dog on is the comfort and safety of your dog and yourself. This is important so that you have an enjoyable time. When you decide to buy a kayak which you can take your dog in, you need to decide the type of kayak you need. Should you buy a single kayak or a tandem kayak. Some kayaks in the market can seat one person and others two. Some can seat three people. Ultimately your kayak should have room for your dog. If you have a small dog then you can opt for a single kayak. It is not great, to be honest, and you may feel cramped at the footrest part of the kayak but other than that it is fine depending on the breed. You can opt for a tandem kayak if you are fine with your dog sitting in front of you. The problem of a tandem kayak is that when you start out, your dog won’t be comfortable in the water and adding to that, the seat which will be between your dog and you will make it even scarier for your dog. You can opt for a tandem kayak. A tandem kayak generally has double the space of a single kayak. You will be able to comfortably fit into a tandem kayak along with your dog as compared to a normal single kayak. Even if you have a small dog, when you consider that you will have to carry other items too like food, drinks, extra clothes, and safety equipment, it makes sense to have a tandem kayak as compared to a single kayak. Some of these tandem kayaks are even equipped with a kayak dog seat. Often times however, you can just just get an add on dog seat on many models of sit on top kayaks. Another option that you will need to choose from is a sit-in or a sit-on-top kayak. A sit-on-top kayak is a basic floating platform. It is easy to inflate but your legs will be exposed. When you use a sit-in kayak your legs are protected. Many people prefer a sit-in kayak as it gives more protection and the chance of losing your balance is lower. A sit-in kayak will also give you more space on the kayak when you compare it to a sit-on-top. This is because the space taken by your legs can be used to store other items. Some smaller dogs prefer to be in a sit-in rather than a sit-on as they feel more protected on your knees rather than in the open. But if you have a big dog, you may need a sit-on kayak. Before you decide how much space you need on your kayak, it is best to check the size of your dog. Measure it from the head to the tailbone. You will then get a perfect idea of how much space he or she will take on the deck. I prefer a sit-on-top kayak when it comes to a kayaking with your dog. This is because a sit-on-top kayak will allow your dog to move around freely on the kayak. If they want, they can jump into the water and get back on to the kayak easily. Another advantage is that in case the kayak flips, it won’t fill with water and capsize. The water will just drain back into the ocean or the sea. A sit-in kayak may fill with water and then draining it may be difficult especially since you will have to manage the kayak and your dog. As I mentioned above, you need to check the size of your dog before you decide on the kayak which you will be buying. It is always good to buy a kayak which is bigger than your dog by a wide margin. This will allow your dog to stretch their legs when they are on the kayak. A whole day on the water may get tiring for your dog and it will be helpful for their muscles to stretch a bit. A bigger kayak will also give your dog a comfortable and enjoyable experience on the kayak making him a pro kayaking dog in no time. Another important thing that you need to keep in mind when you buy the kayak is that the width of the kayak should be sufficient that even if your dog is standing as per the width, all four of its paws should be comfortably on the kayak. If not, when your dog is moving around on the kayak, it may lose its footing and slip off. Potentially putting you and your best buddy in the drink! Ensure that your dog wears a flotation device at all times. This will ensure that no matter what happens in the water, your dog won’t drown. Make sure that you get your dog to wear it on the shore itself and ensure that the straps are secure. Ensure that you have sufficient water and food for your dog and yourself. When you start out, make sure that the water you go in is calm. This ensures that your dog gets used to being on the water and doesn’t get scared. Prepare your dog well in advance on the shore. You can do this by getting on the kayak and getting off the kayak on shore. This will help you to control your dog when you are in the water. Finally, make sure that the kayak that you buy has the capacity to carry the weight of your dog. This is very important. If you have a heavy dog, make sure that the kayak can carry the weight of your dog, the equipment and your own weight. If you plan to fish on the kayak, make sure you keep in mind that you will also have to consider the weight of your catch on your way back. You will also have to consider how much gear you are bringing with you for fishing. If the kayak can’t carry all the weight, it will lose its buoyancy and it will be difficult to paddle back to shore. If it sits too low on the water, there’s a possibility it may even sink. There are kayaks in the market which have a weight carrying capacity of 500 pounds and more. These should be more than enough to carry the weight of your dog even if your dog is 75 pounds. A tandem kayak is more comfortable than a single kayak. This is because there is generally more space in a tandem kayak when you compare it to a single kayak. Also, your dog will have its own seat. Though this may spook your dog a bit at the start, over time it will help your dog and you to be more comfortable when you are in the water. If you are opting for a single kayak, make sure that the seat is spacious enough to fit your dog and you. It would also be good if your kayak has adjustable foot braces, an adjustable seat, and thigh and knee rest. This ensures that your kayak is comfortable. When you take your dog out in the water, you will need to carry a bit more equipment than you generally would. The main things are water, dog food, and a first aid kit and of course a dog pfd, especially if you are paddling away from the shoreline. The bigger your dog, the more you will need to carry water, due to the heat and open air, he/ she will feel thirstier when out in the hot sun. Even if you are on a freshwater lake or river, you shouldn’t allow your dog to drink the water as it may contain geese or duck feces and that can make your dog fall sick. Now that we have seen the main features that you need to keep in mind when you buy a kayak which you plan to take your dog in, let’s check the best kayaks for dogs in the market. If you want a kayak and a paddleboard on which you can take your dog, then the Perception Hi Life 11 feet kayak is perfect for you. Overall, we feel that it is the best kayak for dogs. It is very versatile and is very easy to use. You can use it for fishing, for kayaking with your dog or as a paddleboard. It is spacious enough that you can even take your kids with you on it. The Perception Hi Life is 11 feet long kayak and is a sit-on-top one. You can either paddle it as you would do with a normal kayak or you can stand up on it and paddle it like a paddleboard. The kayak is very comfortable and it has special cushioning across the entire surface which faces the top. This makes it very comfortable to stand or sit on. More importantly, it gives your dog a good grip so your dog can easily stroll across the kayak without losing its grip when the kayak is wet. Since the cushion is on the entire upper surface you don’t have to worry about your dog losing its grip at the edges of the kayak. The Perception Hi Life 11 also has an option of going for a swim with its low-profile swim deck at the rear. It has handles which makes it easy for you to board back on the kayak. You can have a dip in the water with your dog and get back on the board easily. The front part of the kayak is large so your dog can easily fit there making it a makeshift kayak with a dog seat. In addition to taking your dog kayaking, the Perception Hi Life is great for angling too. You can use the two mounting points behind the seat. This makes this kayak excellent for fishing too. You can use the Perception Solo Mount accessory system to install more holders for fish-finders, fishing rods, etc. It can hold a weight of 280 pounds so if your dog and you cross that weight, this may not be too ideal for you. Also, the kayak is best for calm water which should be fine as you shouldn’t take your dog on a kayak in rough water. The Perception Kayak Tribe Sit On Top Kayak is a very comfortable kayak. The thing that I like best about this kayak is that it comes in three sizes. If you have a small dog then you can opt for the 9.5 feet kayak. If you have a medium sized dog, you can choose the 11.5 feet kayak and finally, for a large dog, you have the 13.5 feet kayak. Comfort is another excellent feature of this kayak. The kayak will give you premium seats for the paddlers and more importantly, it has a mold in the center seat on which you can keep your dog on. This is specially made keeping in mind kids and pets. This allows you to kayak with a dog seat insert or allow him to roam around the kayak depending on his size. The seats have thick ventilated padding which makes them very comfortable. It also has an adjustable seat back. This allows you to recline backward or forward so that you get maximum comfort. You have many footrest options so that you can choose the most comfortable as per your height. If you have a heavy dog, you can opt for the 13.5 feet kayak as it can carry a weight of 500 pounds. This is more than enough for carrying your dog, your equipment and you. You get great speed and maneuverability with this kayak. In addition to that, it is very stable. This makes it perfect when you have your dog with you as you don’t have to worry about it losing its balance. The stability increases along with the size of the kayak. On a 13.5 feet kayak, you can have a large dog on one seat or a small dog on the mold in the seat. Since the kayak has excellent buoyancy and is very stable, you don’t have to worry about safety when it comes to this kayak. The Perception Kayak Tribe Sit On Top Kayak like all the Perception kayaks is very durable. It is made of high-quality, high-density polyethylene. It has a one-piece roto-molded construction. This ensures that the kayak resists impact abrasions. You don’t have to worry about your dog’s nails scratching the kayak. The seats of the kayak are far enough from each other so that even if you are paddling with someone else, you don’t have to worry about the paddles clashing against each other. In addition to that, the kayak has a mount in the center so if you want to paddle alone, you can be in the center and can keep your dog in the front or the back seat. If you are a beginner and want to take your dog out kayaking with you, this is an excellent kayak because it is stable and easy to use. You can keep an eye on your dog rather than having to keep an eye on the kayak to see if it is stable. The third kayak that we recommend is the Ocean Kayak 12-Feet Malibu Two Tandem Sit-On-Top Recreational Kayak. The Ocean Malibu Kayak is one of the most popular in the market. It is light in weight, compact and very durable. The kayak is versatile and you can paddle it alone or with another person. You can paddle it easily even if you have a heavy dog with you as the kayak is light at 57 pounds. You have two seats and you can put your dog in one if it is large. If not, you can put it in the special section for pets. It has three molded-in seats. The overlapping foot wells of the kayak are patented and make the kayak very comfortable. The seats have four-way adjustability. This ensures that you get a perfect fit and are comfortable. It also gives the molded seats better slip protection so your dog gets a better grip. Patented overlapping foot wells allow center-seated paddlers to settle in and brace their feet comfortably. The kayak has a weight carrying capacity of up to 425 pounds. The maximum length you get is 12 feet long and the width is 34 inches which makes it great for having your dog with you. You get a lifetime warranty on the hull of the kayak. You can convert this kayak from a tandem to a solo easily. Since it has three sets of footwells, you can put a seat in the center and it becomes a solo kayak. While most people would automatically picture the dogs nails going into the bladder and popping the kayak the reality of the situation is that inflatable kayaks are very durable and can take quite a bit of impact. This is because some of them have outer nylon coatings on the PVC which protects these kayaks from sticks and other items that lie under the water. If you enjoy fishing in your kayak and would like your dog with you for the company then the Coleman Colorado 2 Person Fishing Kayak by Sevylor is the perfect kayak for you. It is made specifically for fishing and since it is wide and spacious, it is excellent to take your dog along. One of the biggest issues when it comes to fishing on an inflatable kayak is the durability. The Coleman Colorado 2 Person Fishing Kayak is made of 18 gauge PVC construction. This is then covered with 840 D nylon and has a 1000 D Tarpaulin bottom. This ensures that no matter how shallow the water and regardless of the rocks or pointy branches that may be in the water, it won’t affect your kayak. Since the material is tough, even if you hook on to the kayak by accident, it won’t puncture or tear. To ensure that the durability goes one step further, the kayak has many air chambers so even in case one chamber is punctured, your kayak won’t capsize and you will safely be able to go to the shore with your dog. The Coleman Colorado 2 Person Fishing Kayak has all the accessories that you would want as a fisherman pre-mounted on the kayak. You get a pair of Berkley Quick Set Rod Holders. This makes it easy for you to cast. You also the trolling motor fittings pre-installed. The kayak has D Rings that allows you to attach any other equipment that you may need. You can also put the tackle in the mesh pockets that it has on the sides. Another advantage of the Coleman Colorado 2 Person Fishing Kayak is that it is very quiet. In general, inflatable kayaks make less noise than normal ones. This helps when you want to go fishing as you don’t disturb the fish. In addition to that, your dog too will be calmer when it is quiet. One issue with the kayak is that it doesn’t have a pump and since it has many air chambers, it gets exhausting to inflate it. You also don’t get a paddle with it but you can buy a good paddle online. You can also check our detailed review about this kayak here. The reason I like it a lot when it comes to an inflatable kayak for dogs is that it is very stable and very comfortable. It is long enough for your dog to easily stretch on the kayak. At 650 pounds, the Sea Eagle SE370 Inflatable Sport Kayak is an excellent kayak for taking your dog with you especially if you have a large one. The thing I like about this kayak along with its weight carrying capacity is that it is excellent value for money. The Sea Eagle SE370 Inflatable Sport Kayak is very affordable and is stable. This makes it a perfect kayak for a beginner who wants to get started in kayaking. 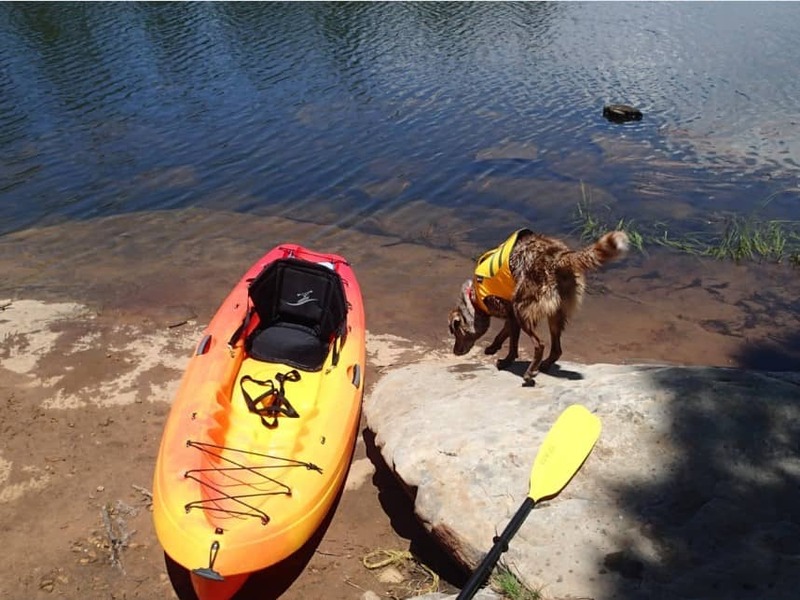 Even a beginner can take their dog on this kayak without worry since it is very stable. The Sea Eagle SE370 Inflatable Sport Kayak is made of high-quality material and is very sturdy. You don’t have to worry about it getting punctured. This kayak is perfect if you want to take your dog out fishing, paddling or just to have some fun. The kayak can hold a lot of weight so you don’t really have to worry about the kayak sitting low in the water or capsizing. You can load it well and it still will float easily due to it’s high maximum weight capacity. It is easy to paddle and turns quickly and easily. The tracking is reasonable though not great. You can’t expect great tracking with an inflatable kayak anyway in most cases. The kayak is very light so you can carry it on your own and you don’t need help. You can just roll it up and put it in the trunk of your car. Even though the price is very low when you compare it to other branded kayaks of the same quality, you still get loads of accessories with this kayak which include a paddle, a carry bag, a pump, an inflatable seat, and a repair kit. The only thing that you will really need to buy is a lifejacket for you and your dog. You can move the seat as you please. This helps a lot when you have a dog on board. You can paddle solo and keep the seat at the center with your dog in front of you. This allows you to keep an eye on your dog and your dog will be reassured as it is not too far from you. The pro package comes with seats which are very comfortable and are well worth the slightly increased rice. The seats will ensure that you don’t get a backache even if you spend the whole day on the water. Another aspect of the Sea Eagle SE370 Inflatable Sport Kayak that I like a lot is that it gives you a 3-year warranty. This is very generous considering its price. The thing I like best about the Driftsun Voyager is the speed at which it inflates. You can inflate the kayak in less than five minutes. You also get a double action high flow hand pump. You can go from the trunk of your car into the water in a matter of minutes. The kayak is very compact and easy to maneuver. It is also very easy to transport and when it deflates it fits very well into a carry bag. It comes to below 27 pounds when it is deflated so it is very easy to carry. Another great feature of the Driftsun Voyager is that it is very durable. The material used at the bottom is heavy-duty PVC. This ensures that the kayak won’t get punctured. The Boston valves which are double threaded ensure that there are no leakages and 840D coated oxford fabric nylon top cover is tear and rip resistant. The Driftsun Voyager is very sturdy and durable and you don’t have to worry about it getting a puncture and your dog and you being stranded in the middle of the water. This is also because it has multiple air bladders to insure you stay afloat. The Driftsun Voyager comes with a lot of accessories. You get two EVA padded adjustable seats, two kayak paddles made of aluminum which have grip handles which are ergonomic. You get a double action deluxe hand pump as we mentioned above. It comes with a repair kit, rear tracking fin, and a travel bag. You can remove the paddles and break it up into sections when you want to store them. The seats are very comfortable and since they are adjustable, you can spend the whole day on the water with your dog and not get a backache. Another great thing about the seats is that they are adjustable seats and not inflatable ones. Inflatable seats tend to get hot as the day progresses which makes them uncomfortable. It can even give your dog or you blisters if you sit too long on it in the heat. I like the design of the Driftsun Voyager which has a pointed nose entry at the bow and a rocker profile which gives excellent performance in choppy and calm water. You also get a deep fin which is removable which will improve the tracking. The kayak has a rear drain so you can clean the kayak easily or drain it easily if it flips. Since the seats are adjustable, you can use the kayak as a two-person or a solo kayak. You can easily adjust the seat so that your dog is comfortable and you get more leg room. Overall given the high-quality, the level of comfort your dog and you get, the ease in which you can inflate, deflate, store and carry the Driftsun Voyager, I consider it an excellent kayak for dogs. As you can see, there are many excellent kayaks that you can use to take your dog with you when you want to kayak or fish. The Perception Hi Life 11 is perfect if you have a medium weight dog and overall is our best choice. It is very versatile and has excellent reviews online. If you are looking for a long kayak which can carry the heavy weight of up to 500 pounds then go for the Perception Kayak Tribe Sit On Top Kayak. It is very durable, very stable and has a special seat for dogs. Finally, in hard kayaks, the Ocean Kayak 12-Feet Malibu is a great choice as it is very stable and durable. When it comes to inflatable kayaks for dogs, the overall best as per our research is the Sevylor Coleman Colorado 2-Person Fishing Kayak. If you love fishing and would like to take your dog out with you when you are after the fish, this is the perfect kayak for you. The Sea Eagle SE370 Inflatable Sport Kayak is great when it comes to price. It is very affordable and gives you a lot of value for your money. Not only is the kayak made of high-quality and is durable, but it also gives you a 3-year warranty. It is perfect if you are a heavy person and have a large dog as it can carry 650 pounds. It is perfect if you are on a budget. Finally the Driftsun Voyager 2 Person Inflatable Kayak is perfect if you are looking for a kayak that is light, durable, easy to carry and easy to inflate.